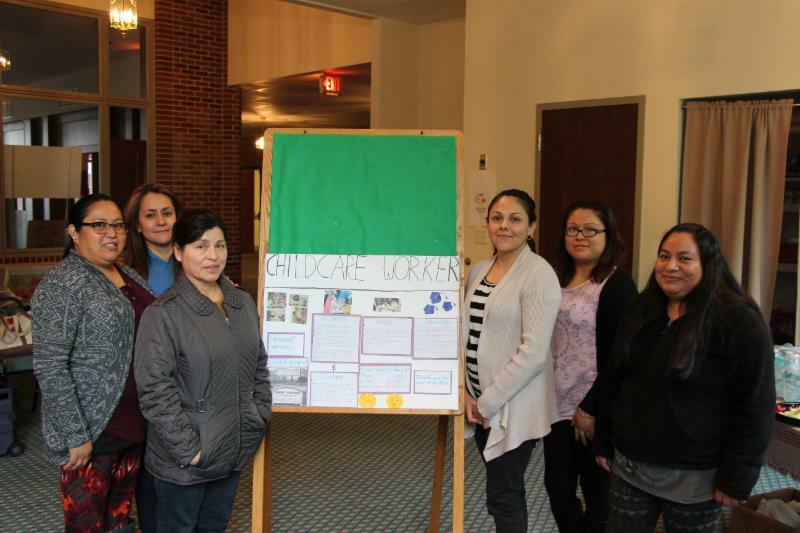 To an immigrant with limited English and limited formal education, the notion of a full-fledged career pathway in the U.S. may be daunting, but it is one that the students in the CCIU’s Family Literacy program have unmistakably faced head on. Instead of simply studying a job-themed vocabulary set or decontextualized grammar, students earnestly engaged in a purposeful, scaffolded project, building meaningful career awareness step by step. The project began simply enough with brainstorming, discussions, and writing activities related to job interests, skills, and experiences. 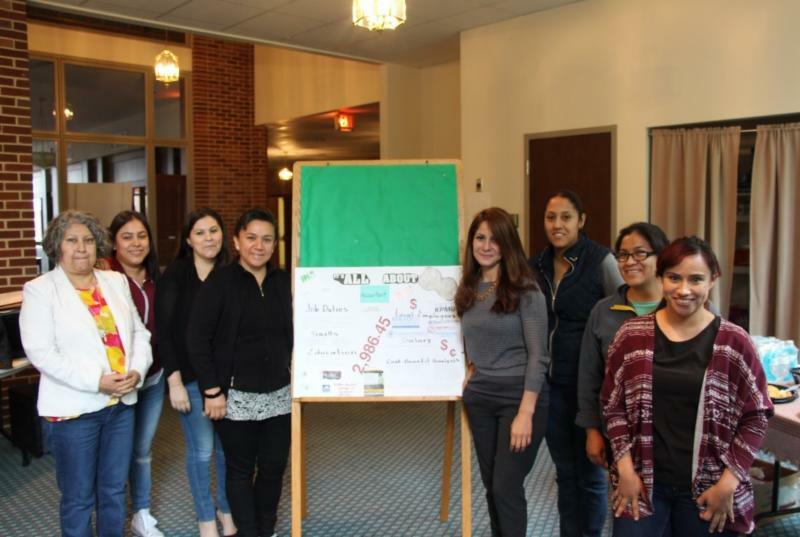 Then, in order to gain a deeper understanding of a focused and personally meaningful career option, students were placed in groups based on mutual interest in jobs such as nurse, childcare worker, and accountant. After the teacher modeled her own presentation on the career of a university professor, students were given a rubric to begin researching and crafting their own posters detailing essential, though often unexamined information like educational requirements, expected salary, and local employers. One especially helpful source was the U.S. Department of Labor’s comprehensive career database: www.onetonline.org. When presentation day arrived, the results proved to be an impressive culmination of students’ hard work. Not only were the oral reports a showcase of sustained speaking in English, they elicited genuine questions from the audience, as classmates continued to push one another to clarify and comprehend the nuances of the various careers. For example, the differences among Certified Nursing Assistants and Aides, Licensed Practical Nurses, and Registered Nurses turned out to be an area for further investigation. As a follow-up to the presentations, students then participated in a gallery walk activity, taking notes and leaving questions and comments on sticky notes for each poster hung up on the walls around the classroom. This close analysis allowed for even richer class discussion as careers were compared and contrasted and their advantages and disadvantages were debated. As the famous Chinese proverb states, “a journey of a thousand miles begins with a single step,” and students in the Family Literacy program can now be proud to have taken a solid first step toward a fulfilling career. See a description of and the rubric for the project. Formative assessment: According to The Glossary of Education Reform, the term refers to methods teachers use to evaluate their students’ comprehension, learning needs and progress during class time. Access the article to read more about examples of formative assessments and how they can accelerate the achievements of all students. The Teaching Channel offers some great resources including articles and videos describing formative assessment. Teaching Excellence in Adult Literacy (TEAL) has a fact sheet about formative assessment that can be found on the LINCS site, connecting many of the suggestions to our adult students. Improve the quality of your instruction and boost your students’ outcomes by learning about some of these techniques for formative assessment. An article from Edutopia gives teachers four questions that can help students to deepen their understanding of any reading. Comprehension of virtually any text can be enhanced by thinking about and discussing four simple questions. Not only that, but you can use these questions to assess your students' understanding and use that to tailor your further discussion and teaching. This article explains and gives examples of each question. How much do you really know about literacy? The Coalition on Adult Basic Education (COABE) and the Voices in Literacy collaboration have created a trivia game to help people across the country learn more about this deeply impacting national issue. Play the Literacy Trivia game and see how much you know about literacy and how literacy advocates can make a difference. How On Friday, May 19th, 10:00AM-12:00PM, Meg Ashenden and Joy Zamierowski will host a webinar titled, Adopting a Growth Mindset. This is brought to you by the Adult Literacy Basic and Secondary Education Division (ALBSE) of PAACE. You can register online. The Reading Family Literacy program was featured this month on WFMZ-TV and in the Reading Eagle, highlighting their role as the first group to try out new play centers at the Reading Public Library. The new play center trunks contain themes of a grocery store, construction site, veterinary clinic, and kitchen/restaurant, and they encourage interaction between children and parents through play and reading. The 25th edition of the Pennsylvania Career Guide has been released by the Department of Labor & Industry and is available online. The information within is meant to be a helpful resource for people who are preparing either to continue their education or enter the workforce. An interest assessment and information on PA CareerLink services and apprenticeships can help job seekers to get started. It also contains the employment, wage, and job outlook data for 250+ occupations found in the Occupational Data Bank. For those planning to continue their studies, a month-by-month checklist for a senior year of high school and post-graduation plans can be a great resource. The Pennsylvania Career Guide is available online or in printed copies by CWIA via email at workforceinfo@pa.gov or by phone at 1-877-493-3282. .
As part of the Grant Writing for Beginners series, GetEdFunding.com has a new article about designing and presenting a timeline in a grant proposal. A timeline will keep your team on task and show your funder that you are ready to accomplish your goals. Simple and to the point, this article suggests a list of things to include and a list of tips to keep in mind. These are state or national organizations' newsletters that may be of interest to you. To receive the most recent editions by email, please subscribe directly to the newsletter . World Education/U.S., Features resources and information from World Education projects including The Change Agent, College for Adults, E-Learning, LINCS Region 1 Professional Development Center, National College Transitional network, and many others.